Ridge Racer is one of the videogames’ classic sagas. This year is the 20th anniversary of the launch of the original game, and the fans remain loyal to this title, which appeared in 1993 and became one of the top games of the first Play Station. From there, it jumped to various platforms, both consoles and PC, and more recently it made the jump to touch devices with Ridge Racer Accelerated, whose delivery was not well received by its fans. Now, as part of the 20th anniversary celebration, it has released a new title, Ridge Racer Slipstream. Namco Bandai Games is responsible for this new release, available for iOS and Android devices, which brings all the speed and the most typical skids of the series to touch screens devices. 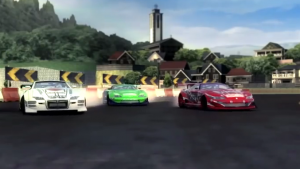 Ridge Racer Slipstream maintains the idea of the original game, so our goal is to end the race in the first position or finishing in the shortest time possible. The excitement and entertainment are two of the key points of this saga, and in this release both are present from the start. The controls are configurable, and we can choose them how we like, whether virtual accelerometer, automatic or manual acceleration, virtual icons, etc. The car is easy to control and can quickly begin to compete with our rivals. When we start the game, we have several cars to choose from, and as we progress, we can improve them and unlock new ones. Driving is very important and much of the role lies in our hands. We must make good use of slipstream and turbo, as both are key factors if we want to get there first. The slipstream is a key point in Redge Racer Slipstream. We will stick to the car in front of us and drive it forward using its wake to save some fuel and get the speed necessary to overtake it. In addition, the turbo will also require a bit of strategy on our part, since we have a limited amount of nitro to provide the burst of speed required to reach the podium. Ridge Racer Slipstream has 10 circuits and their mirror versions, so we’ll have plenty to choose from. The scenarios are varied and interesting, such as Harbor Line, Industrial or Lost Ruins, among others. The vehicles also have their characteristic behaviors so that each circuit offers a different experience depending on the car we use. 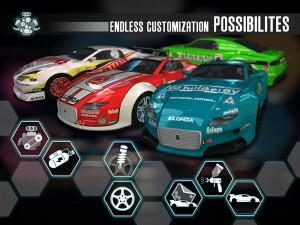 The game is free but has in-app purchases to get improvements without waiting to accumulate points with the races won. Also, some car models can only be obtained through in-app purchases. The game requires 1GB of RAM and a dedicated GPU, if we are not confident to meet the requirements, we can check the details before starting the download. We can download Ridge Racer Slipstream from the App Store or the Google Play respectively. Be sure to have Wi-Fi connection before starting the download, as it has more than 800MB of data!